Formed 37 years ago in England by Jay and his twin brother Michael, the band made inroads in the Goth and Post-Punk scenes, releasing their debut album PROMISE in 1983. By the time of their third album, DISCOVER in 1986, the band’s sound had more depth, more focus, more power and more hooks. Still beloved by the Goth crowd, the Aston brothers and band (which, by this time, included Stevenson on guitar and Rizzo on bass) broke free of their ‘cult band’ status and started having hits. With “Heartache” and “Desire,” the band’s profile in the U.S. soared with airplay on influential radio stations like KROQ and video rotation on MTV and local music shows. Their fourth album, THE HOUSE OF DOLLS (1988) was yet another success and the band was poised to make the big leap into the waiting arms of commercial success. Sadly, Michael Aston quit the band, and the remaining members (now including former Spear Of Destiny drummer Chris Bell, who first played with the band on their 1985 album IMMIGRANT) decided to carry on. The KISS OF LIFE (1989) and HEAVENLY BODIES (1990) albums followed but the line-up hiccup and the ever-changing musical climate dampened their commercial progression. Still a beloved live band with a devoted audience, the band slowed things down a bit for the next decade, releasing a few studio sets and pursuing other projects in between those GLJ releases. In the meantime, Michael Aston had moved to the U.S. and decided to put together a new American version of GLJ by hiring a group of L.A. musicians and recording and touring under the Gene Loves Jezebel name. With TWO versions of the band on the scene, it was perfectly understandable that casual fans of the band were confused. 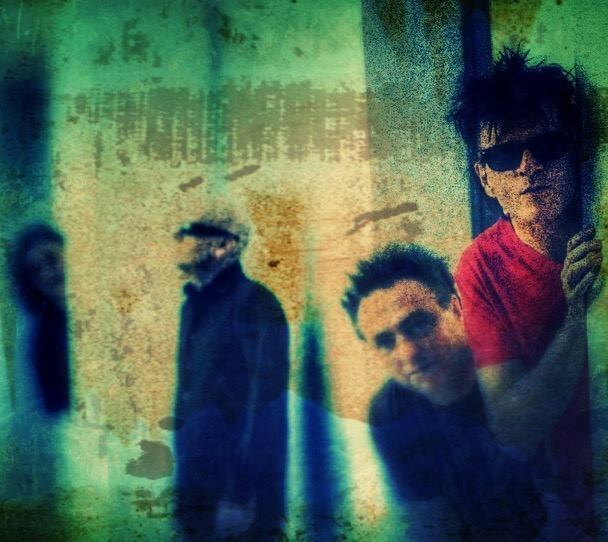 After years of legal squabbling and behind-the-scenes headaches, it was decided that the decades long line-up of Jay, James, Pete and Chris had to operate under the name Jay Aston’s Gene Loves Jezebel in the U.S. while keeping the old name in the UK. It worked just the opposite for Michael’s version of the band. It has been many years since Jay Aston and the boys have released a studio album, but 2017 welcomes DANCE UNDERWATER, one of the finest albums of their career. Their uniquely wonderful sound is still intact and the songwriting on the album is on par with their ‘classic’ albums released in the late ‘80s and early ‘90s. With Peter Walsh back in the producer’s chair, the band doesn’t try to emulate their early sound. DANCE UNDERWATER is a more intimate and warm album. The classic chord changes are still there, the mighty guitars of Stevenson still punch you in the gut yet they sound more personal. The album’s lead track, “Charmed Life (Never Give In)” is perhaps the most immediate cut on the album, but every song here draws you in to their mix of melancholia and mayhem. “Summertime,” “IZITME,” “Flying” and “Chase The Sun” are classic slabs of GLJ while “How Do You Say Goodbye (To Someone You Love),” “Cry 4 U” and “I Don’t Wanna Dance Underwater” up the ante, creating a mood that is both familiar and fresh. Not many bands creeping towards their 40th Anniversary are able to create albums that rival their best-sellers from three decades ago but Jay, James, Pete and Chris – and not forgetting producer Peter - have done just that. STEPHEN SPAZ SCHNEE: DANCE UNDERWATER has just been released. How are you feeling about the way the album turned out and the reaction to it so far? JAY ASTON: Very pleased to have made a new Gene Loves Jezebel album. I never expected to ever make another one and the reaction has been largely very positive indeed. SPAZ: The album retains the classic GLJ sound while also adding more intimacy and warmth. Was it your intention to create a more personal and direct listening experience or is that how the project organically came together? JAY: We are the same team that made “Desire” together. Peter Walsh produced that song first for us and was subsequently involved in several other GLJ albums that featured many of our best known songs. James Stevenson, Pete Rizzo, Chris Bell and I go back a long way. Put us together with Peter Walsh and voilà. SPAZ: The band’s music has evolved over the years. Some still think of GLJ as a Goth Rock band yet you evolved from that scene long ago into something far more dynamic and melodic. Where do you feel that GLJ fits, genre-wise, in the scheme of things? JAY: We’ve always tried to sound different to everybody else. I believe in songs. We don’t really fit in with any genre, I guess. We sit in our own space. Bands like Japan were the same in that respect. SPAZ: This is the first all-new album from this line-up in quite a while. When the four of you get together to record, is it an easy transition in the studio or does it take some time to work out the kinks? JAY: Nothing to it. I whistle a tune and off we go. SPAZ: While you are the voice of the band, James, Pete and Chris are huge pieces of the band’s dynamic. The band’s chemistry really comes out in the studio. How much input does everyone have in the creation of the tracks in the studio? JAY: It’s a real group in every sense of the word. Everybody has an essential role. For some reason, we always seem to click. It’s easy for us. SPAZ: The band has a very unique sound and it is hard to get a grasp on your influences. Songwriting-wise on this album, there’s a touch of Bob Dylan in a few tracks. Which artists inspired the band… and continue to inspire you? JAY: Dylan influences any writer I think. The “Shakespeare of Rock” as I heard Willie Nile say recently. We all bring different influences though. Peter “Bugg” Rizzo wrote quite a lot on this album and he has a a lot of Post Punk influences I think. Me, I still love Dylan, (Joni) Mitchell and (Neil) Young primarily, but there have been so many songs and singers that have touched and inspired me. SPAZ: Are there any particular tracks on the album that you feel really defines GLJ in 2017? “Charmed Life (Never Give In” is one of your most commercial tracks. “Summertime” is glorious. “I Don’t Wanna Dance Underwater” and “How Do You Say Goodbye (To Someone You Love)” are simply lovely. This is certainly one of the best albums of your career. JAY: Thank you so much. Probably Actually the three tracks you mention! Apart from “Charmed Life” (James Stevenson’s music, but Pete’s angles) Pete Rizzo wrote the music (and some of the lyrics!) and this is the first time he’s ever done that for GLJ. His input was massive on this album. SPAZ: Are these tracks that you’ve been working on since the last album or were these composed relatively recently… perhaps specifically for DANCE UNDERWATER? JAY: Most of the album was written before we went into the studio. Vocal melodies and lyrics were written in the studio for several of the songs though. I worked upstairs in a attic, whilst the lads completed the music in the studio downstairs. “Cry 4 U” (bad spelling is a nod to Slade and our Glam Rock influences) took me the longest. Up all night on that one. It was a very intense album to record. No time to reflect. “Charmed Life” came together very quickly. “Izitme” (again that early 70’s influence) was something I had in my back pocket, but a a lot of the lyrics came together on the spot. SPAZ: No matter how heavy or soft the songs are, there’s a sense of melancholia in every track on DANCE UNDERWATER. Is there an emotional theme running through the album or were they songs that you felt worked the best together? JAY: We tried to make an “up” album. Lyrically though, much of it reflects a great deal of pain (the devil is in the detail). Peter Rizzo’s input definitely coloured the record. The album’s title is his. SPAZ: How many tracks did you have initially earmarked for the album and is there enough material left over for a new GLJ album in the near future? JAY: I write every day, so I have a lot of material. There were a couple of Pete Rizzo songs that could easily have the album. James Stevenson picked out most of the songs for this album. JAY: Peter is brilliant. He makes you work so hard though! To make a true Gene Loves Jezebel album, he was obviously the right man. He’s so very musical. James and Peter have worked together a lot over the years (Scott Walker albums for example) and get things done very effectively. He plays keyboards and sings backing vocals on the album too. SPAZ: The album was funded via PledgeMusic. Did that confidence from your fans inspire you and the band? Or was there more pressure because of it? JAY: We didn’t have time to worry about what anybody thought really. Apart from the fear of getting a cold. It was winter after all and this was our only shot at it. I couldn’t afford to lose my voice! We just all got together and it all happened very naturally. It was great being involved with the fans. One of the highlights was the day several came to the studio to check our progress as part of the pledge. SPAZ: I assume these new songs fit perfectly amongst the classics during your live set? How much touring do you plan to do for the album? JAY: We did a handful of gigs in Europe before the album came out and we played half the songs from it. We even finished our set with a new song! The songs worked very well with the older material. We’d like to tour the album in 2018. We’re looking at European gigs in February/March. U.S.A. in May. SPAZ: While I am hesitant to mention it, there are two different GLJs operating at the moment: your version, which contains four of the five original members, and the L.A.-based edition led by your brother. Do you find it frustrating that some casual fans are getting confused? JAY: Of course. We almost changed the name of the band to try and solve the problem. As soon as the label and everybody else heard the album though, there was no doubt that it was and had to be a Gene Loves Jezebel album. SPAZ: What’s next for Jay Aston and Gene Loves Jezebel? JAY: We’re due to visit Japan this month, but 2018 should see us touring Mother Earth. I guarantee that in sound checks, we’ll start jamming new tunes. Always happens with us. Chemistry! SPAZ: What are you currently spinning on your record and CD players? JAY: I listen to all kinds of stuff. I love finding 60’s folk stuff. Tom Rush for example. There’s a purity I love. The ‘60s generation was full of hope. I cling to that spirit. It feeds my dreams.